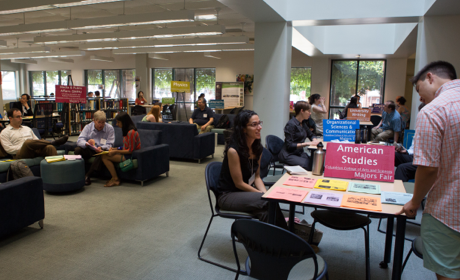 Eckles Library provides numerous resources to the Mount Vernon Campus and GW community. Whether you're a student in a University Writing course or a faculty member exploring the wide variety of academic journals GW offers, Eckles Library can assistant with all of your research needs. Each spring, Eckles Library honors excellence in freshman research with the Eckles Prize. On evenings during the academic year, Eckles Library hosts walk-in, no appointment necessary tutoring on intro-level courses in economics and math. The Writing Center hosts appointment-only sessions, offering face-to-face interaction with writing consultants trained in freshman through post-doctorate and faculty levels of writing.